To start debugging in Visual Studio 2012 (VS 2012), you have three options: simulator, local machine and remote machine. VS 2012 comes along with a Windows 8 apps simulator which is awesome in that developers can test their apps from different kinds of perspectives, eg. landscape/portrait, screen resolutions, gestures and geolocations. However, if you have a VPN connection activated when debugging, the simulator may not start properly. It occurs especially when the Windows account you logged on is different from the one that you use to authenticate to the remote VPN server. 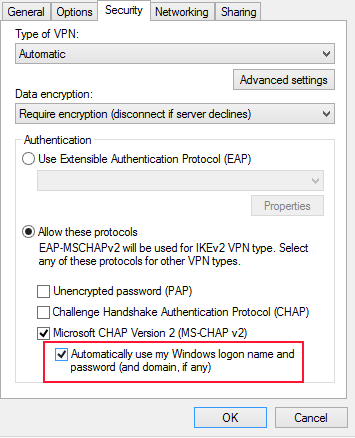 If your Windows 8 apps simulator fails to start, just enable “Automatically use my Windows logon name and password (and domain, if nay)“.